What does the day of love hold for you? Maybe your Valentine will send you flowers or your kids will make you a special card. Denny's wants to start your February 14 on a high note with free coffee. 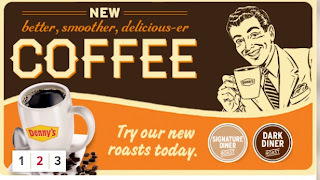 On February 14 from 6 am till 2 pm, guests at Denny's restaurants nationwide can enjoy a free cup of the new coffee blends. Denny's has three new coffee blends on its menu, Signature Diner Roast, Dark Diner Roast and Signature Decaf Roast. These new blends are a result of two years of testing and trials. Restaurants nationwide have all new equipment and accessories to brew these new blends. Let cupid strike your love of coffee at Denny's this February 14. Thanks for the heads-up, there's a Denny's near my office yey! Very cool! Gotta have that coffee! I have not been to Denny's in forever! We use to play cards there lol. Yummy! I'll have to take the kids for a special Valentine's Day treat. Yay, I love coffee! Thanks for the heads up! I love coffee and haven't been to Denny's in awhile. Thanks!